The case is still intriguing: three young brothers disappear without a trace, their father becomes an uncooperative suspect, and their fate remains unknown to this day. Covering the story was a job for Lynn Thompson, until it became more. Over the past nine years, The Bryan Times reporter has collected information concerning the 2010 vanishing of the Michigan brothers, the doubt surrounding their father, John, and the fruitless efforts of law enforcement and civilian volunteers to find them. 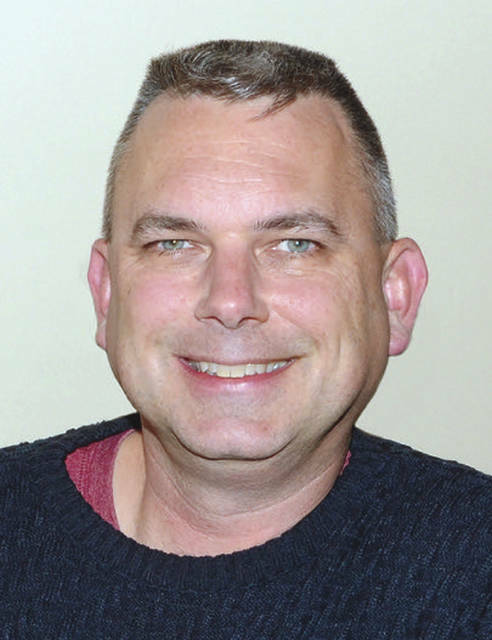 Thompson, 49, will share his experience at a presentation, question and answer session, and signing of his book, “76 Minutes: My Search for Andrew, Alexander and Tanner Skelton,” on Saturday, March 30, 10:30 a.m., at the Wauseon Public Library, 117 E. Elm St.
Culled from a plastic tote full of notes, interviews he conducted, and his experiences during the investigation, the book delves into the facts behind the boys’ disappearance, the search for evidence, and the father’s seemingly blatant deception regarding his involvement. Published by Faded Banner Publications of Bryan in January, the 145-page tome also speculates about what really happened to the Skeltons. “My whole approach was (investigating) everything around the incident – tell the whole story or as much of it as I could,” Thompson said. The West Unity native covered the story for The Bryan Times from the start: During the Thanksgiving holiday in 2010, John Skelton of Morenci, Mich., was visited by his sons, nine-year-old Andrew, seven-year-old, Alexander, and five-year-old Tanner, at his Congress Street home. Skelton was estranged from his wife Tanya Zuvers, who had full custody of the children. Seen last playing in Skelton’s yard by his neighbors, the boys went missing. When Skelton failed to return them to their mother the next day, she discovered he was being treated in a Toledo hospital for a broken ankle. He claimed he got the injury from a fall to his basement floor during a botched suicide attempt. He said the plan to kill himself included placing the boys in the custody of an acquaintance, Joanne Taylor. The minister’s wife knew of his intentions but apparently made no effort to stop him. Thompson said Taylor was reportedly “a paragon of virtue, supposed to do anything for anybody.” Skelton presumably asked her to keep the boys safe from their abusive mother – an accusation against Zuvers that proved false. An Amber Alert was issued for the brothers, and for 10 days law enforcement officers searched for them across an 80-mile swath of Lenawee and Hillsdale counties in Michigan and Fulton and Williams counties in Ohio. When police investigated Taylor, they discovered she was fictitious. So were others Skelton would claim to have left the children with as his story constantly changed. They included a non-existent, child-protective organization called United Foster Outreach Underground Services. Upon leaving the hospital, Skelton appeared in Lucas County Court on three kidnapping charges. He was extradited back to Michigan, where in 2011 he pleaded no contest to three counts of unlawful imprisonment. He is serving 15 years in Bellamy Creek Correctional Facility in Ionia, Mich. The Skelton brothers remain missing. The Michigan State Police took over the open case in 2013. Over the years, Thompson, a member of the Indiana National Guard who served two tours in Iraq, questioned authorities including Williams County Sheriff Steve Townes. He also spoke with retired police officers and retired military intelligence analysts, and conducted a formal interview with Zuvers. But writing a book about the case was almost an afterthought. The book took six years of all-night stretches and before-and-after work sessions to complete, even as the investigation into the disappearances continued. “It’s still hot, still ongoing, but they haven’t found anything,” Thompson said. He also thinks Skelton’s ankle injury, a hairline fracture Thompson considers too minor to result from an alleged 10-foot fall to a basement floor, was the result of a misstep while he disposed of the bodies after dark. “The bottom line is, I don’t think he broke his ankle in a suicide attempt,” he said. Thompson became somewhat involved in the investigation after convincing authorities in 2013 to search for the brothers in a wooded area across from the Lazy River Resort Campground. Located more than three miles northwest of Holiday City in Williams County, it was the area where a cell phone tower recorded a connection with Skelton’s phone for 76 minutes in the early hours of Nov. 26, 2010. Nothing was found but a Spalding Little League baseball, oddly perched in the fork of a tree. It was placed in evidence. Wauseon Library Director Maricela DeLeon said she’s already had numerous inquiries about Thompson’s appearance. She said it will offer a new perspective to the investigation. Thompson said he plans for a second edition of the book should new information come forward. “76 Minutes” will be available at his session, and can be found at Amazon and fadedbanner.com.